Since the middle part of last year, I have been contacted by several British friends living in London. They said 2016 was the 40th anniversary since the Punk Rock music was born. Taking this opportunity, some British TV stations are producing programs featuring Punk Rock music, and my friends were being interviewed and some of them will be performing as the main character of those programs. It was in 1976, 40 years ago, that the Punk Rock started as part of the things I was experiencing in London in my 20’s. In those days, I could feel a new wind blowing as I walked various places in London, and fashion and music of young people in town were extremely exciting to a Japanese like me. Such an atmosphere continued through early 1980’s. Young people in London with Mohican haircut and wearing leather jacket and Dr. Martin’s boots were extremely interesting and good target for my photography. Nobody could stop the trend of the era. When two to three years have quickly passed since the Punk Rock music appeared, young British people started to use the word “New Wave” instead of the word “Punk”. When I asked young men and women who looked like musicians “What kind of music do you play?” as they were passing by, many of them said “New Wave”. In live houses, such as Marquee or Lyceum, Punk Rockers were shouting. But from 1979 to early 1980’s, a movement after Punk called “New Romantic” already started in a club called Billy’s. They were the young people who were leading the next movement as they moved from club to club, and a hairdresser named Steve Strange was the leader of the movement. While there were several clubs that those people gathered, Blitz where my friend Frankie took me was the most famous one. And the scenery observed on every Thursday night through midnight at that club was as exciting as the appearance of Punk. The characteristic of the New Romantic music was more of a pop music, opposite from the wild Punk, and their appearance was very unusual with delicately worked makeup and colorful costume, different from the destructive Punk. A few years in the early 1980’s was a time when Punk and New Romantic co-existed, and young people in London selected a style suitable to themselves and continued to assert themselves while experiencing both the Punk and the New Romantic. We could see signs saying “PUNK IS NOT DEAD” on the street walls and on the back of leather jackets. I have some vivid memories from those days. One of them took place in 1979, when I was sharing a floor with a few British young people on 36 Goodge Street, in central London. Among those young people, there was George who was extremely friendly. After a few months, he became Boy George of Culture Club, a super star of the era. My life became more positive from that day. 37 years have passed since then. Whenever I have a chance to talk at talk shows or in classroom, or when I have a chance to write an essay, I talk about this incident with Joe. 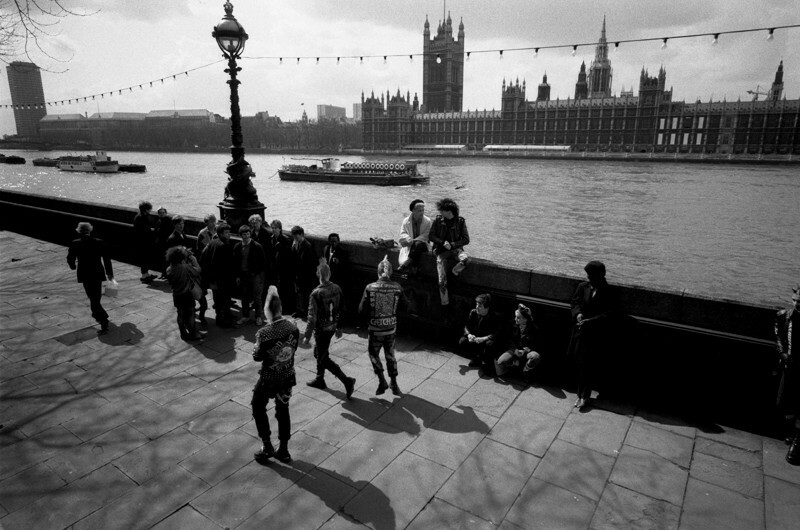 Even for the generations who do not know about Punk, or even for the people who have no interest in London or in music, I can share the feeling and encourage them. In the fall of 2015, one early Sunday morning, I was invited by Rio Hirai to join her radio program on J-WAVE. She was an excellent interviewer letting her guest talk in a way to correctly convey his career, ideas on life and characteristic to the listeners. I spoke about the incident with Joe in this program too. A few days later, I read several messages delivered to the program. One of them from a truck drive of age 50 was as follows. My answer was “never too late”. This truck driver must have been observing towns and people through the window of his truck while driving during the last 30 years. What he saw from his truck driver’s seat somewhat higher than that of a sedan. People crossing the pedestrians walk after shopping. Two lovers standing on the side walk. An old man disappeared after making a turn beyond the shop. A row of primary school kids wearing yellow hats. Sometimes over a window wiper on a rainy day. Sometimes in the afternoon of a strong windy day. Big city in the dusk. On a slope in country side. He should be able to stop his truck to shoot a photo targeting at whatever he sees people’s life in it. It is OK even if the window frame or a stain after the wiper movement stays in the image. If he could shoot a photo of one instance of a people from his driver’s seat in a safe way, that should be his point of view. I don’t think that photos taken in a similar situation exist. If he could take photos in such a manner, his 30 years was not a waste. On the other hand, it was a valuable time during which he was observing the society or people. The day when you become a photographer is not the day you acquired your own camera. It is the day when you found your photographic subject.